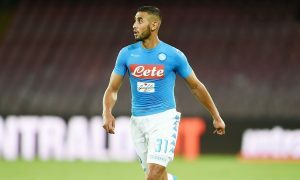 Manchester City have ended their reported interest in signing Napoli left-back Faouzi Ghoulam, according to a report by calciomercato.com. The 26-year-old Algerian has been strongly tipped to be Pep Guardiola’s next addition to the defence in recent weeks, after Benjamin Mendy suffered a long-term injury, leaving Pep without any natural left-backs. However, the emergence of Fabian Delph in the position and Danilo’s ability to fill in mean Mendy’s injury hasn’t led to complete disaster. Youngster Oleksandr Zinchenko was also tested at left-back against Wolves in the Carabao Cup, although struggled at times. Whether City do dip into the market for another natural left-back remains to be seen, but calciomercato.com reports that their interest in Ghoulam, for now at least, has been ended recently. If Ghoulam fails to renew his Napoli contract, he will be a free agent next summer, which could lead to City renewing their interest – unless they buy in January.